Go soak your hand: If your finger has swelled up (for whatever reason) and you can’t take your ring(s) off, soak your hand in a bowl of ice water. In just a few minutes, the ice water will shrink your swollen finger enough to allow you to remove your jewelry. Do the dishes: Wet your finger, and put one or two drops of liquid dish detergent (or soapy water) above and below the ring. 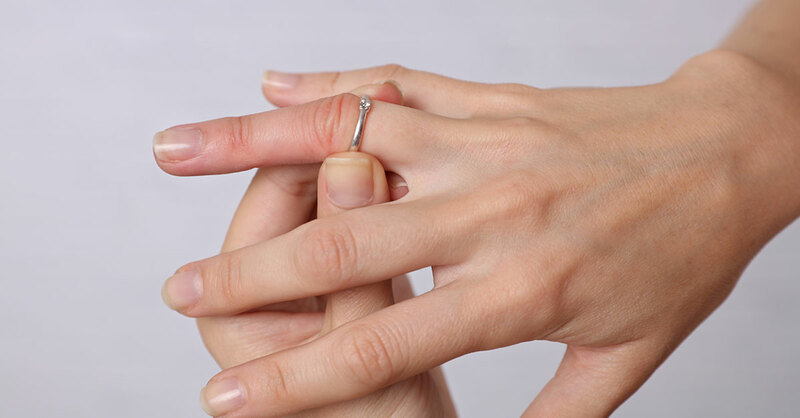 It will lubricate your finger so the ring can slide off easily. Just be careful your jewels don’t slide off down the sink drain! Slick on a condiment: Look in your refrigerator or kitchen pantry for a drop or two of some slippery stuff. Coat your finger with mayonnaise, olive oil, vegetable oil or butter—your ring should slip right off.